Explore the pristine wilderness of the Turtle Flambeau Flowage with one of our pontoons. Great for fishing, watching and photographing loons, eagles, osprey, or other wildlife. Enjoy the many sandy shores to swim or just relax. We deliver to your resort, local landings and some area lakes. It is a great way to transport your gear if camping on one of the many islands. One of our pontoons has a wide gate opening for wheelchair access. There are no stairs at the dock for ease of entry. A $200.00 deposit is required to reserve. Applicable taxes and gas not included in prices. $100.00 cabin rental discount with a week pontoon rental. $50.00 cabin rental discount with a three (consecutive) day pontoon rental. Need to book a five night minimum stay to qualify. Book early to ensure we have one available. Life jackets included with rentals. Applicable taxes and fuel not included in prices. definitely a lot to see and do here and we will be back! cabins are so relaxing and beautiful. Can’t wait till next time. and blackberries! Our whole trip was awesome! goodtimes here. Saw lots of deer and a very large wolf (gorgeous). skiing. We will definately be back next winter. accommodations made for an awesome week! The cabin fit our family of 5 very well. Gene and Darla for sharing your “corner” of the northwoods with us! 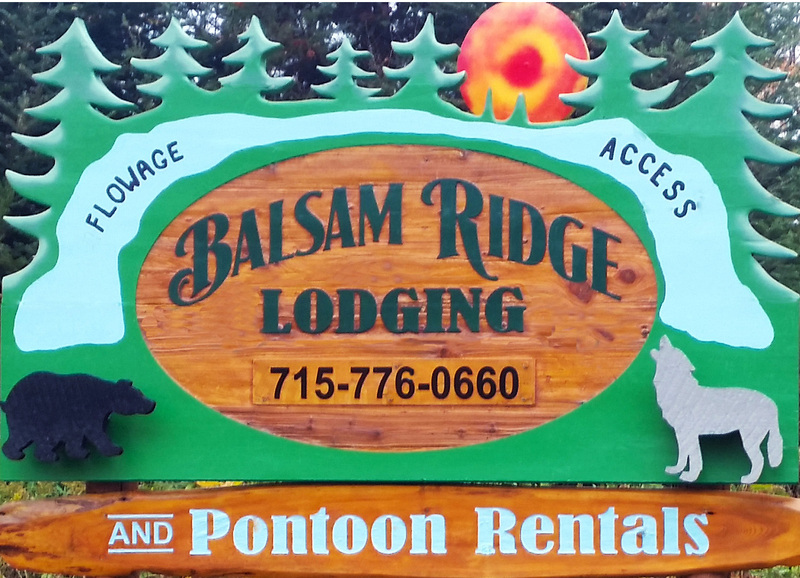 Copyright © 2015 Balsam Ridge Lodging. All rights reserved.